Dakota is now 7 years old and doing great! She just started gymnastics and does great in school. She has no restrictions, no hospitalizations, and no delays since she turned 2 years old and finally caught up! She has a deep pectus which most likely will need to be fixed when she is 12 or 13, but other than that - and being pretty darn tiny - you would never know her start! She was diagnosed at 29 weeks by an excellent and experienced OB and an excellent and experienced ultrasound technician. As you know, it's hard to see RCDH and when we got referred to a local high risk OB to confirm the diagnosis, they couldn't see anything in Dakota's chest and didn't know what had caused her heart to shift.... They were going to just pass me around and refer me to get an echocardiogram. But luckily I am impatient, and I did my own research. I couldn't find a single case where they thought it was CDH, but it wasn't, so I decided I was going to make my own plan and not wait for the doctors to pass me around a ring of referrals. Thank God I did. I found the Real Hope for CDH website and I was so excited because Dr. Kays was in Florida! I live 5 hours south of Gainesville in Marco Island, Florida (only 2 1/2 hours south of St. Petersburg! YAY!). My local hospital didn't even have a Level II NICU, so there was no question I was going to have to relocate. I would have gone anywhere - wherever was best. I was so excited that the best was in Florida! I called the day after my tentative diagnosis and got an appointment for the next week. I saw Dr. Kays at 31 weeks. Dr. Richards, the OB that Dr. Kays worked with, immediately confirmed the right-sided CDH diagnosis. Dakota had all of her intestines and some of her liver in her chest. However, she had a good LHR of 2.4. We met with Dr. Kays and he gave us a good prognosis and told us she most likely would not need ECMO with that lung to head ratio; however, he explained it in case. He said she looked to be a moderate case but they would never know for sure until she got here and that babies have their own plan. Also, he told us that one of the things that could affect prognosis was prematurity. He also explained that right-sided CDH cases in his opinion were not worse (as much of the literature I had read implied or outright stated); he said they were just different. He said it was a generalization but that they started sicker but then got better faster. My husband and I made a plan to move up to Gainesville at 34 weeks and to stay there around 3 months. We borrowed my in-law's motor home and reserved a spot in an RV park about 10-15 minutes from the hospital. However, the best made plans... On Christmas Day at 32 weeks and 5 days, less than 3 weeks after our diagnosis, I started to have back pains. I thought it was just my back, but I asked my husband to take me to the hospital to get it checked out. If it was early labor, I wanted to stop it-knowing the challenges Dakota would face. We got to the hospital (about an hour away from my home) and they told me I was 7 cm dilated and Dakota was coming and labor could not be stopped. I told everyone I saw, "My baby has congenital diaphragmatic hernia. She's not going to be able to breathe. She needs to be intubated, then she needs to go to Dr. Kays at UF-Shands Hospital in Gainesville. "* I repeated this refrain over and over to everyone I saw for 15 minutes. Then my OB showed up and I relaxed a little since I knew she knew about the diagnosis. She told me the neonatologist was there and ready to intubate Dakota. I honestly was not in very much pain at all since I was so focused on what was happening. Dakota came less than 45 minutes after arriving at the hospital. My OB told me there was some meconium in the fluid but that she didn't think she had inhaled any and that she looked pink and they told me within what seemed like seconds that she was intubated. I didn't touch her or even see her before they took her away. The neonatologist came up to me and said they had Miami Children's Hospital on the phone and I screamed "No!!!! I told everyone, she is going to Dr. Kays at UF-Shands in Gainesville - it is all set up!" He stepped back and said, "Ok, I wish I knew that." I honestly could have hit him. My husband gave the doctor Dr. Kay's card and even though it was Christmas Day, and Dr. Kays was supposed to be on vacation, he took the call and instructed my local hospital on the settings on the ventilator. Then he immediately sent out Shands Air to pick up Dakota. They arrived at the hospital about 4 hours after Dakota was born and came in the room. 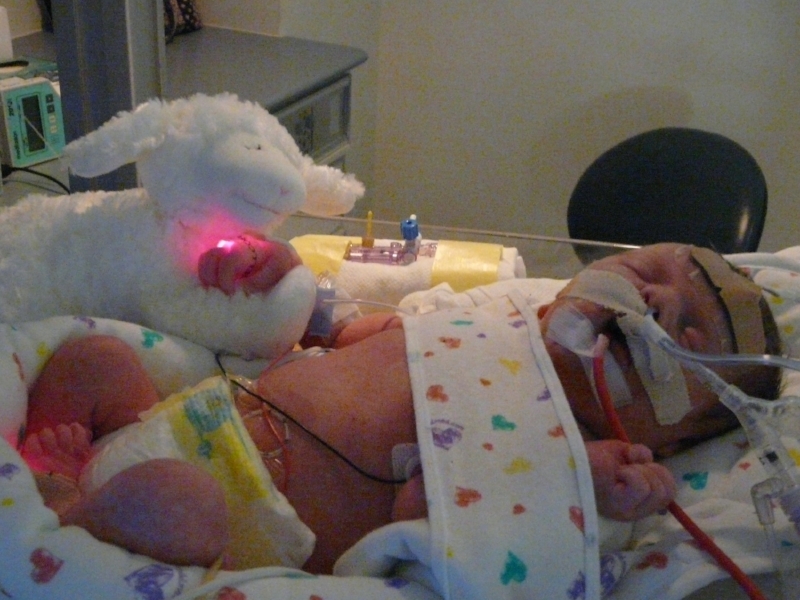 The nurses wheeled Dakota in the incubator up to me and I told her to fight and I would be there soon. I looked around and the room was full of my family with tears running down everyone's faces. The Shands Air nurses handed me a folder with a phone number to call to check on Dakota and other information about the NICU. I clutched it to me as it was all I had. I had to spend the night in our local hospital and then my husband and I would drive up the next day. Through the first night, I called in every few hours and Dakota got there and was doing good. But when I called in the next morning, I started to get not so good reports. They said they had turned up the ventilator and that Dr. Kays would be in contact with me. I finally got discharged and was in my office grabbing some things and writing frantic notes and ready to get on the road to see my baby when Dr. Kays called. My husband was downstairs loading up the car. Dr. Kays's voice was so kind and calm. He said that Dakota was ok but that she was at maximum settings on the ventilator and that "I'm at the end of this tool bag, so I need another tool bag." He recommended ECMO. I immediately said "Yes! Yes! Do it. Whatever you can and whatever you think - that's why I picked you. I want to do whatever we can." I now realize the pressure statements like that must put on Dr. Kays but he takes it all. I went down and told my husband about the phone call - he was waiting in the car. I realized that I should have asked him first what he thought but I would not have accepted any other answer and my husband was in complete agreement. All the way up, I told Derek stories from the blogs I had read about babies who had been on ECMO but were fine now. I told him this was a normal step. I got myself in a positive frame of mind and I would not allow anyone to intrude on it. About an hour out of Gainesville, I got a call that she was on ECMO and stable. The nurse said that they had actually already turned down the settings and that she was doing well. And that Dr. Kays had gone home, which was a great sign (as all Kays' Kids parents know - Dr. Kays will stay by a sick baby's side all night if needed and won't leave until they are stable). I really saw my baby girl for the first time that night. She was so beautiful. The nurse showed me her chart and her numbers and why she had needed ECMO, and her numbers since ECMO and how well she was doing. They had again turned down the flow. The nurse showed me each monitor and how to read it. My husband and I talked to Dakota and told her how proud we were of her. The next day was very calm. She was supposed to be on ECMO for 10 days. Her 4th day of life, however, I came in to the alarm going off on the ECMO machine. I was terrified. I had no idea what was going on. The nurse was up on a stool and maneuvering Dakota gently around. I just watched with terror on my face. She repositioned Dakota and the alarm stopped. The nurse looked at my face and I'm sure my husband's face and quickly explained that they were having a hard time getting the ECMO flow at the level Dr. Kays had ordered it at and that the cannula must have shifted. But, she said this very strongly, "Look at your baby! She is pink. Look at her saturations. They are at 100. She is fine. This is just an issue with getting the flow but she is doing fine. Just watch your baby! Don't look at this machine." The alarms kept going off every 15 minutes or so! The surgeon came by and studied the readings and asked the technician what flow they could sustain with the current position of the cannula. She told her and so the surgeon said, well, turn it down to that flow and let's see how Dakota does. So the alarms finally stopped. Dakota was still satting at 100 and still had excellent blood gasses. I got back from lunch and was told that during lunch they spotted a clot in the machine tubes but that it had not reached Dakota, but since clots were forming now, the cannula would need to be repositioned if they were going to keep her on ECMO. Since Dakota was doing so well through all the drama, she was showing us she didn't need ECMO anymore. They called Dr. Kays and got his advice and agreement as he was on Christmas vacation, and then removed Dakota from ECMO after less than 3 days! She stayed perfectly stable like a rock star! After that, our stay was fairly normal as she progressed through the steps. She had her surgery done by Dr. Kays on Day 13 and needed a Gore-tex patch. She ended up missing about 40% of her diaphragm on her right side. She had about 40% of her liver in her chest. After being extubated, she couldn't quite hack it on the low flow oxygen, so she was placed on CPAP - old school hard cannula CPAP - which she HATED!!!! She fought against it the whole time, but ended up having to stay on it 10 days due to an infection in her PICC line that set her back a few days. She was then finally placed on the low-flow cannulas at 30 days and we got to hold her for the first time - best feeling ever!!!!!!!! It took another 30 days to teach her to eat enough by mouth so we could go home. She didn't have an oral aversion, per se, but she was not very interested in eating and was very slow and weak at it. She was slowly progressing though and still gaining weight. She avoided the Nissen/G-tube surgery very narrowly. She had reflux, but it was just ok enough that we could treat it with medicine instead of having the surgery. She was progressing with the bottle, just slowly. Finally we pulled the G-tube out of her nose and did a 48-hour-stay-in and fed her on demand. She gained a tiny bit of weight each night, so we got to go home on Day 60!!!! It was a tough few months at home getting Dakota to eat enough, but we had a chill pediatrician who just wanted to make sure she was slowly but surely gaining weight, which she was...so we struggled through it. In retrospect, we had a long discussion with Dr. Kays about what had happened on Dakota's second day. We still don't to this day know why she came so early. I had no risk factors for it and did not have excess amniotic fluid at the time. She didn't test for any of the usual infections, however, Dr. Kays suspects and hypothesized that she came early because of an infection or alternatively, that she got an infection shortly after birth from the meconium in the fluid. He thinks that is why she crashed on her second day. Her white blood cell count was extremely low that day and the next few days I know they were watching it as it slowly rose. The ECMO stabilized her and got her over the hump and made sure her brain stayed oxygenated during her crash. They immediately had given her antibiotics upon arrival, which they always do, and then gave her more when she began crashing. He said that once the infection stabilized and the antibiotics likely kicked in, she wouldn't need ECMO anymore and would begin behaving like they expected her to. Actually, her prematurity, even at a significant 7 weeks and 5 days early, really didn't play a huge factor. She was relatively large for her birth week, 5 lbs 3 ounces! And her lungs were fairly developed for that week as well...well, her good lung was. What can I say? She is a miracle baby. What I am so, so, so grateful for is that even though she was less than 34 weeks at her birth, when she crashed, Dr. Kays believed she could survive and gave her a chance and put her on ECMO. This allowed her to stabilize and protected her beautiful brain until she could get over the hump. Every other hospital I have ever heard of has a strict rule of not allowing a premature baby under 34 weeks to go on ECMO, but what is so wonderful and unique about Dr. Kays is that he treats each baby individually - not by a set of rules. And he believes that each baby will survive. That made all the difference in our case and I know in my heart that Dakota would not have survived anywhere else with her beautiful brain protected - if she survived at all anywhere else, without ECMO, the oxygen loss would most likely have resulted in severe disability. She is now a healthy, happy, perfect 7-year-old. She's smart, kind, observant, and has a gentle soul. She is our miracle and our joy! We are so grateful to Dr. Kays and his team and his belief in and passion for babies! Please let me know how I can help in any way!!! My contact info: 239-304-6074 email: jennifertrafton@hotmail.com. *Dr. Kays is now with Johns Hopkins All Children's Hospital.